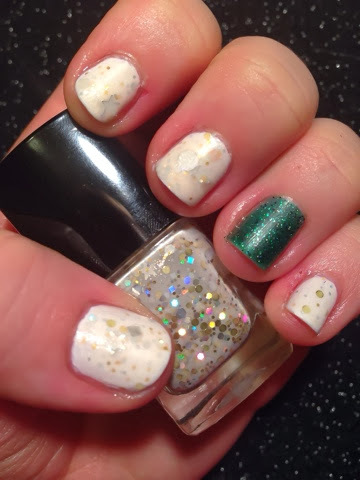 I've finally gotten round to trying the fabulous Dollish Polish Christmas collection. Based on the National Lampoon movie Christmas Vacation. First I tried 25,000 Imported Italian Twinkle Lights a white crelly full of twinkling glitters of many sizes. They're silver and gold so they really do look like Christmas Tree lights. There also star shaped glitters and dots, both of which make me happy. 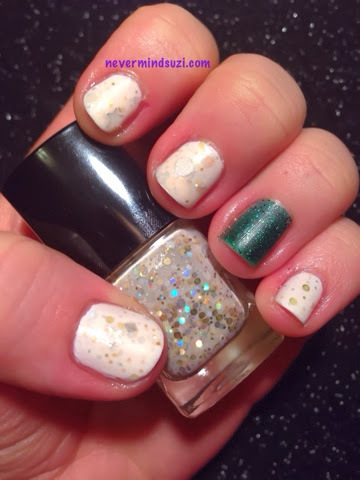 I wore this over Sinful Colors - Snow Me White. I'm going to try it alone though next time. I wore Griswald Family Christmas Tree as an accent nail and it's such a pretty jelly. A green glitter jelly to be precise. I decided I'd like to wear this mani matte so I whipped out my brand new matte topcoat from OPI. Got to say, I like it! So far I think the Born Pretty and OPI are my favourite matte topcoats.